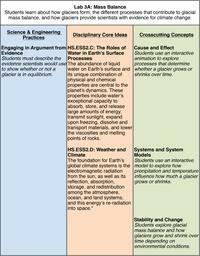 The lab activity described here was developed by Erin Bardar of TERC for the EarthLabs project. In the first part of this lab, students will learn about how glaciers form and the different processes that contribute to glacial mass balance by using an online interactive to explore how glaciers provide scientists with evidence for climate change. In Part B, they will learn about how & why glaciers move. In Part C, students will make a model of a glacier out of a putty-like substance called gak and conduct a hands-on experiment to explore glacial movement. In Part A: Students begin by reading this excerpt about land ice (Acrobat (PDF) 305kB Jul2 11) from the NSIDC page All About the Cryosphere. They then explore glacial accumulation and ablation processes using an online interactive produced by the University of Kentucky that shows them how scientists are able to determine whether a glacier is growing or shrinking and whether changes in the glacier's mass balance are related to climate change. In Part B: Students read a short background essay and watch the NOVA Science NOW video Fastest Glacier (running time approximately 5 minutes). They then do a simple experiment that demonstrates how a layer of melted water acts as a lubricant that speeds up glacial movement. This experiment can also be done by teacher as a demonstration at the front of the class. As a class, discuss the content of the video and how it relates to the experiment/demonstration. In a mixing bowl, combine 3/4 cup warm water and 1 cup glue. Stir until well mixed. In a second mixing bowl, combine 1/2 cup warm water and 1 tsp of Borax powder and stir until the powder is fully dissolved. Combine the contents of the two mixing bowls, and stir until a glob forms. Put half of the glob back into the first mixing bowl. Add a few drops of food coloring. Use your hands to knead the mixture in each bowl until it is well mixed (approx. 2-3 minutes). Wear rubber gloves to prevent staining your hands with the food coloring. Break off pieces of the white gak and pieces of the colored gak. Lay them out in strips of alternating color. Smush the strips together to reform a single striped glob of gak. In a mixing bowl, combine the glue & 2 oz cold/room temperature water. Stir until well mixed. In a second mixing bowl, dissolve borax in hot water & slowly add it to glue mixtureworking quickly, as the mixture will thicken. PDF of excerpt about land ice (Acrobat (PDF) 305kB Jul2 11) from the NSIDC page "All About the Cryosphere"
In Part A: Consider assigning reading as homework. In Part B: Consider projecting the video for students to watch together as a class. Be prepared to facilitate a discussion and give a simple demonstration of how meltwater beneath a glacier makes the glacier flow faster. Slide a wooden block across a table or desk. Then slide an ice cube across the same surface. Have students discuss how each object behaved. Which object slid more easily? Now try sliding the wooden block across a wet surface. Discuss how the water acts as a lubricating layer between the block and the table just as it does between the Jakobshavn glacier and the underlying land. Consider assigning "Background Essay: Fastest Glacier" reading as homework. 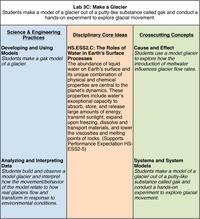 Purpose of the discussion: This discussion will help solidify what students learned about glacier movement in the Fastest Glacier video and the wooden block experiment. Facilitation Tips: Write the primary discussion questions on the board and give students three minutes to share ideas in pairs or to write in their notebooks before starting the full class discussion. Which object in the experiment slid more easily? How does this experiment mimic what's happening with the Jakobshavn glacier? Wrap Up: Before moving on, make sure students see the connections between the lubricating layer of water and the speed of the glacier (and the wooden block). Although scientists are still trying to determine the exact cause for the Jakobshavn glacier's record speed, their observations indicate that warming temperature is the primary contributor. 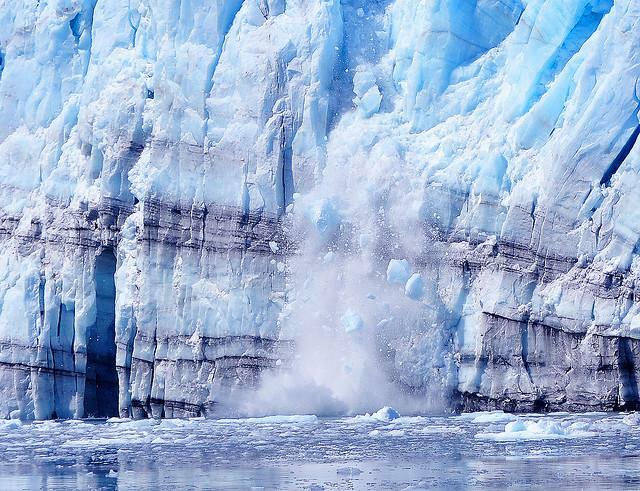 As this glacier surges toward the coast, large amounts of freshwater ice and water are being dumped into the ocean. As students learned in Lab 2, this could have serious consequences for ocean circulation. Studying the Jakobshavn glacier and other glaciers will help scientists better understand how climate and the cryosphere influence one another. In Part C: If time is tight, consider making batches of gak before class. After the lab, place the gak in a ziplock bag and save it for future use or dispose of it in the trash. Suggestions for how to use Student Notebooks for Lab 3. Have students write down the learning objectives for Lab 3. In Part B: Have students take notes as they read the Fastest Glacier background essay and watch the Fastest Glacier video. 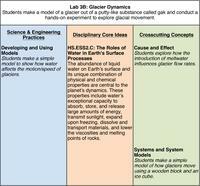 In Part C: Have students take notes and record their results as they perform the gak glacier experiment. Explore background information and content extensions related to Lab 3. Interactive produced by ThinkTV, showing the major contributions to glacial mass balance. Roll over each icon on the glacier in the interactive below to learn about the clues scientists look for to determine whether glaciers are experiencing possible climate-driven changes. Click on the icons to reveal additional information. Eyes in the Sky II Week 2: Intro to ImageJ techniques including how to measure and set a scale. Retreat of Andean Glaciers Foretells Global Water Woes: Article about the impacts the rapid loss of glaciers has on vital water supplies. Earth Exploration Toolbook Chapter Is Greenland Melting?